I actually skipped yoga, which felt weird, but I needed to conserve my energy. I went to a dance class!! It was amazing. There must have been 60 people there. I love that class. It’s like family. I haven’t been there in almost a year, and I got so many hugs, even from people who’s names I don’t know but I’ve danced with over the years. I got a big hug and kiss from the teacher. I worked hard! I didn’t feel like I was working hard, because we took turns dancing and I’d only dance for a minute or two, then wait several minutes for another turn. But man, I was so winded. Towards the end of the class I could barely catch my breath!! I was practically hyperventilating!! Wow, I thought I was in better shape than that. I can run two miles but I can’t dance across a 50 foot floor without feeling like I’m going to pass out? Crazy! It was hot in there too!! I sweat more in that class than I do in the hot yoga class!! I’m not kidding! 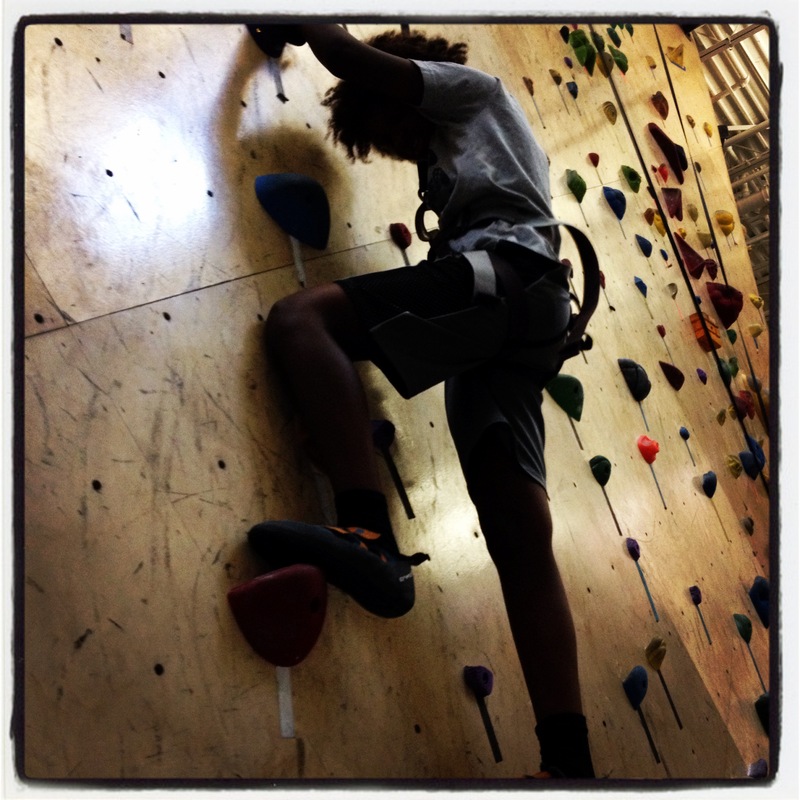 THEN, I went indoor rock climbing!! My friend bought us a pass for a two hour lesson. I’ve done the auto-belay, but I had never learned to belay or let anyone (human) hold the ropes for me. It was really fun!! Variety is probably overrated, but I did really miss dance so I’m glad I’m fitting that back in. Hey, I’m getting better at not buying stuff!! My friend talked me out of getting the fitness bands for my kids (for now, anyway.) He’s really broke, so he’s on the “not buying it” plan all the time. He told me they’d think it was cool for a week and then forget about it. Could be true. My daughter has an iPhone, and like me, ALWAYS has her phone with her, so we’ll start with an app that counts her steps and see how that goes first. I went into Trader Joe’s and bought exactly two things, sesame oil and rice noodles (usually when I think I’m going to do that I end up spending $100.) I used up the three half bags of peanuts I found in my freezer this week, and made Thai peanut pesto with sesame oil, garlic, soy sauce, agave, and red chili pepper. 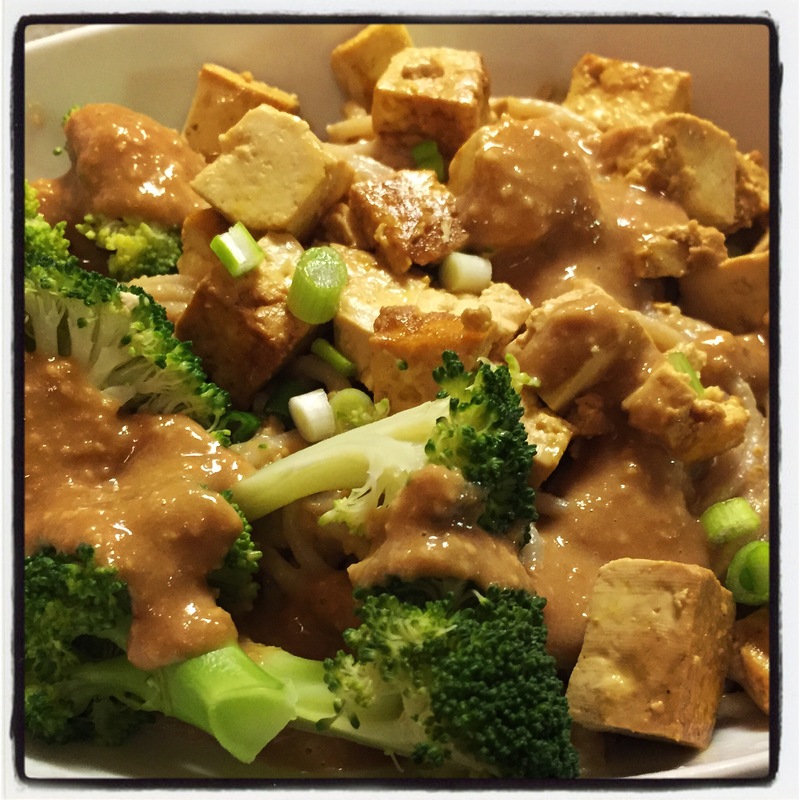 I put it on the rice noodles with sauteed tofu and steamed broccoli, and topped with scallions. These are all things I already had at home. I’m tempted to buy more quinoa or noodles because I’ve used them up, but instead I’m going to try to move on and use the rice. Including my forbidden rice : ) It’s been in my cabinet for at least two years. But no matter how delicious that forbidden rice turns out to be, I promise I will never buy it again. 365 Challenge Day 34 – Rock Climbing! I’m actually not really looking for a new hobby; I have plenty to keep me busy for the rest of my life!! But on a whim I bought a Groupon for a rock climbing gym near my house. A couple of months ago I tried bouldering there, and it was okay, I had fun, but it didn’t really feel like my thing. Well, tonight I met up with a friend and tried the ropes for the first time, and I loved it!! Did I mention I’m afraid of heights? I had thought the ropes would be much scarier because the climb is so high! But it was the exact opposite. With bouldering, even though you don’t go as high, there is a definite possibility of falling, and it still feels like a long way down. But with the ropes! I didn’t have to worry about falling at all, because I was all strapped in and safe. I also think it was physically easier for me because I wasn’t supporting as much weight. My hands and arms cramped up very quickly with the bouldering, but not with the rock climbing. Anyway, it was fun. I don’t think it will be my new hobby, but it is a good thing to be able to do with friends, and a really fun place to hang out. I’d like to bring my kids! Otherwise, I had a nice lunch hour walk along the river at work; and after 10 days without coffee I think my energy is stabilizing a little, with the green tea I’m not feeling as much of the highs and lows as I did with the coffee.